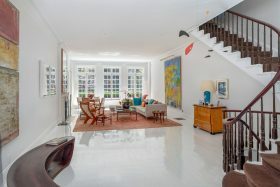 This neo-Federal townhouse, less than a block from Central Park at 9 East 81st Street, received recent exterior and interior renovations from architect Peter Pennoyer–whose work epitomizes Upper East Side style–in partnership with the renowned landscape architect Madison Cox. Better yet, the home’s owners since 2014 are Christopher Davis and Sharon Davis, who is herself a celebrated New York City-based architect (you can see her work featured on 6sqft here and here.). The listing says the house has been “fully and continually renovated by the current owner,” so we can see why it’s so stunning. It was last purchased for $22 million, and it’s currently asking $19,950,000. But with features like an elevator, a grand floating spiral staircase, and 6,150 square feet of living space over five floors, we wouldn’t rule out a bidding war.